Afficher le sujet - [Rules] The Worgens of Pyrewood • Team G.O. Shortly before the Great Cataclysm, the small human village of Pyrewood in the Silverpine Forest was plagued by a mysterious curse. At nightfall, some residents turned into worgens and devouring other villagers. The villagers had to face this new threat and eradicate the lycanthropes before the village counts no more human. The Worgens of Pyrewood is nothing more than an adaptation of the famous Werewolves of Miller's Hollow in World of Warcraft. The game is played in /say (during the day) and en /msg with playmaker (during the night), preferably around a table in an inn or a garrison. No add-on is required and it is possible to play with players from any realm. The number of players is not limited but it is preferable to to be at least 8 (+ the playmaker). The playmaker deals one card to each player (in private message) to determine the secret identity of his character. Players are divided into two clans: the Villagers and the Worgens. To win the game, the players will have a to eradicate all the players of the opposing clan. When a player is eliminated, he leaves the game table or he lays down. The game turns are punctuated by day-night cycles. During the night, the Worgens wake up and and appoint a victim to devour. If they are unable to decide on who to eat, no one dies. Some players with special abilities are also requested by the playmaker via private message. When the day is coming, everyone wakes up, except the poor victim who was eliminated. 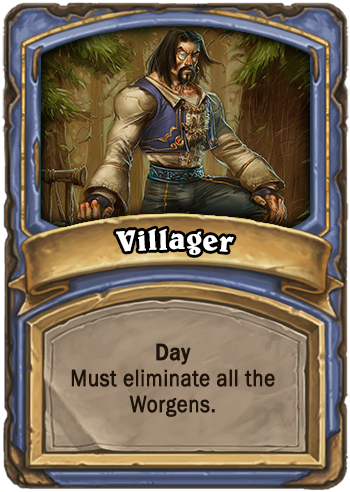 The Villagers will then try to find out who are the Worgens, by inference, using the other players speech and possible revelations, intended or not. The Worgens of course participate in the debate by trying to divert suspicion on other Villagers to eliminate them. The players will have to use many ploys, persuasion and bluff to achieve their ends. During the debate, it is possible to elect the Mayor of the village. The voice of the Mayor counts double in the vote to refer the suspect to eliminate. 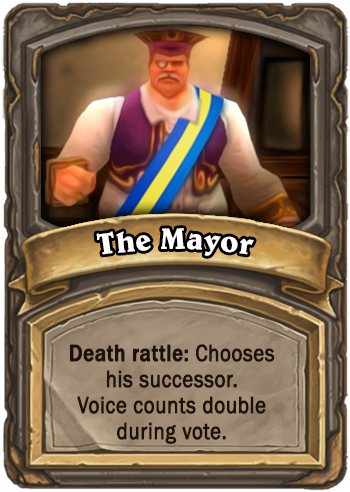 The Mayor can be a Worgen or a simple Villager. At the end of the debate, the players designate a suspect to eliminate. The suspect dies and his identity is revealed. If the players are unable to decide of who to eliminate, another vote le made. If after this second vote they are still unable to decide on the suspect to eliminate, no one dies. The village goes back to sleep and a new night begins. During the night, the Worgens meet in secret and refer a victim to devour. If they fail to decide, no victim dies. Their goal is to eliminate all the Villagers. The simple Villager has no special power. Their goal is to eliminate all the Worgens. 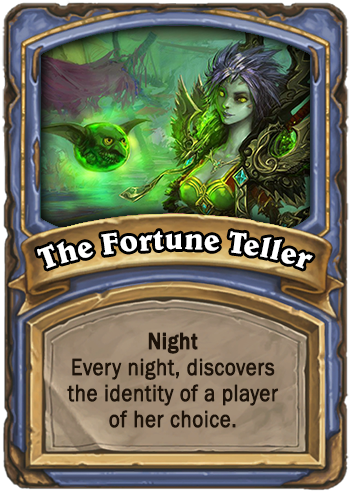 Every night the Fortune Teller can discover the real identity of a player of her choice. She will use this information to help the other Villagers while avoiding to arouse suspicion of the Worgens. Her goal is to eliminate all the Worgens. 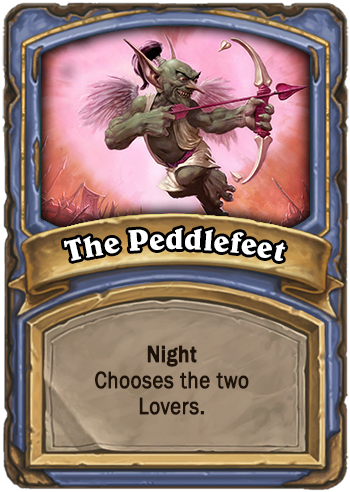 The Peddlefeet is a mischievous character who has the power to make two people fall in love forever, by firing a magic arrow in their heart. His goal is to eliminate all the Worgens. During the first night, he secretly designates the two Lovers, who then discover each other. He may appoint himself if he wishes. When a Lover dies the second commits suicide. In case the Lovers couple is made of a Villager and a Worgen, they win the game if they are the last two survivors. They will have to join forces in secret to win the game. The life potion to bring back to life the victim of the Worgens. The poison to kill another player of her choice. 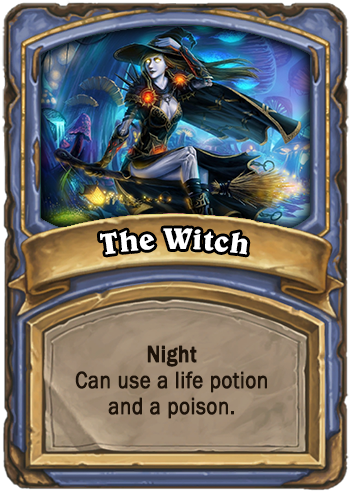 She can use potions on herself (eg to save herself if she was attacked by the Worgens) and even use both potions during the same night. However, each potion can only be used once during the entire game. 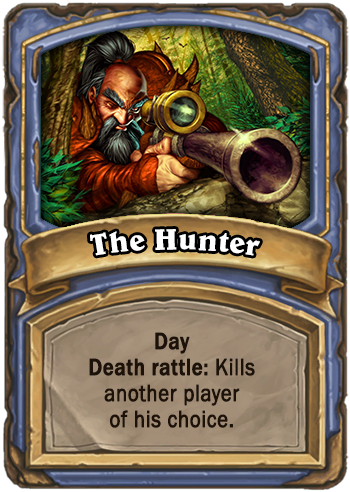 When the Hunter dies, he must replicate in his last breath by shooting to death another player of his choice. 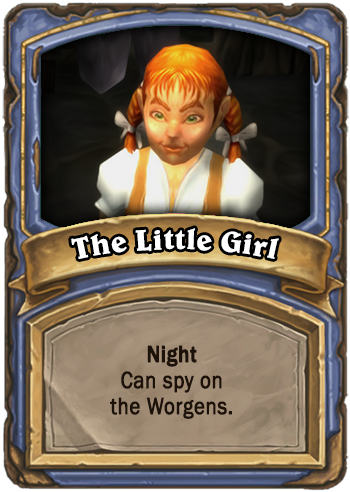 The Little Girl has the ability to spy on the Worgens during their awakening. However this action is risky because she can be spotted by the Worgens. Moreover, because of the darkness, she can also be mistaken and may not identify all the Worgens on the first try, and even mistakenly identify an honest Villager as a Worgen. The risk that the Little Girl is spotted increases every turn. At the start of the first night, the playmaker wakes up the Thief and proposes him to trade (or not) his card with one of two undealt cards. 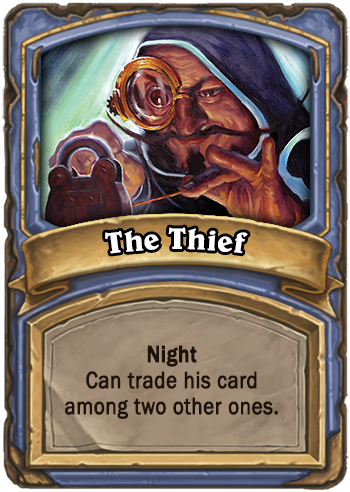 If the two cards left are Worgen cards or if no Worgen card has been dealt, the Thief must then trade his card with a Worgen card. His objective will depend on the chosen card. The roles give additional powers to a character. They can be stacked and may apply to any character. The Mayor may be elected during the debate phase or chosen by the playmaker. His voice counts double in the vote to refer the suspect to eliminate. When he dies, he chooses another player to give him the role. The Lovers are chosen by the Peddlefeet during the first night. The Lovers should protect each other during the game because if one of them dies, the other one dies as well. 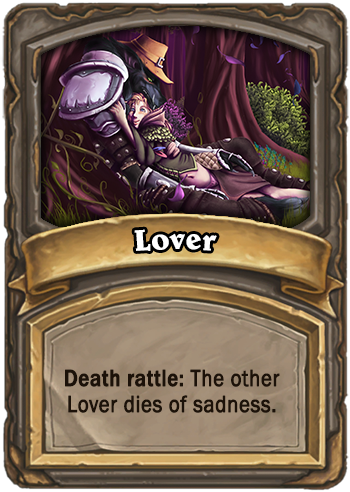 In case the Lovers couple is made of a Villager and a Worgen, they win the game if they are the last two survivors. 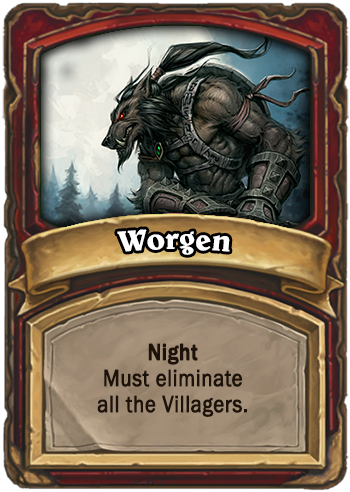 Their goal is then to eliminate all the other players, regardless if they are Worgen or Villager.